← When in “Pride and Prejudice” Does Darcy Accept His Love for Elizabeth? Folk drama is a remote form of oral literature. The early forms included dancers wearing masks portraying animal and human characters. Eventually, speeches and songs were added. The action and the dramatic imitation became the prominent part of these early performances. Speaking or chanting of sacred texts were learned by both the performers and the audience. These early plays were passed on by word of mouth. The section known as “Middle English Plays” from Luminarium: Anthology of English Literature tells us, “In England the folk-plays, throughout the Middle Ages and in remote spots down almost to the present time, sometimes took the form of energetic dances (Morris dances, they came to be called, through confusion with Moorish performances of the same general nature). “Others of them, however, exhibited in the midst of much rough-and-tumble fighting and buffoonery, a slight thread of dramatic action. Their characters gradually came to be a conventional set, partly famous figures of popular tradition, such as St. George, Robin Hood, Maid Marian, and the Green Dragon. “Other offshoots of the folk-play were the ‘mummings’ and ‘disguisings,’ collective names for many forms of processions, shows, and other entertainments, such as, among the upper classes, that precursor of the Elizabethan Mask in which a group of persons in disguise, invited or uninvited, attended a formal dancing party. In the later part of the Middle Ages, also, there were the secular pageants, spectacular displays (rather different from those of the twentieth century) given on such occasions as when a king or other person of high rank made formal entry into a town. They consisted of an elaborate scenic background set up near the city gate or on the street, with figures from allegorical or traditional history who engaged in some pantomime or declamation, but with very little dramatic dialog, or none. Four varieties of plays that we should note from the Pre-Elizabethan period are the Hock-Tuesday Play, The Sword Dance, The St. George and Mummers’ Plays, a development of the Sword Dance, and The Robin Hood Play. Some historians say The Hock-Tuesday Play finds its basis in the defeat of the Danes by the English under Huna on 13 November 1002. Others believe it originates from a remote folk observance: taking a victim by force to serve as a sacrifice. “Hocktide – the Mondy and Tuesday after the second Sunday after Easter – has parallel customs in other parts of the country in which women ‘hocked’ the men (caught and bound them with ropes, or vice versa, or stranger or natives were whipped or ‘heaved. '” Together with Whitsuntide and the twelve days of Yuletide the week following Easter marked the only vacations of the husbandman’s year, during slack times in the cycle of the year when the villein ceased work on his lord’s demesne, and most likely on his own land as well. The Hock-Tuesday Play centered around the struggle between the Danish and the English knights, who enter the scenes on horseback and armed with alder poles. Afterward, foot soldiers for both sides executed drills and then staged a fight scene. The English, as history proves, win the battle. The Sword Dance celebrated the summer driving away winter and death. If chief personages are the fool, dressed in animal skins and “Bessy,” a man dressed in women’s clothing. Rhymed speeches introduce the characters. 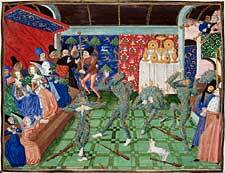 More elaborate forms of The Sword Dance developed in which the “Seven Champions of Christendom” are introduced. These were likely religious interpolations of earlier national heroes. In some versions, one of the sword dancers is surrounded and killed by the other dancers. In other versions, the dancers simply surround him. 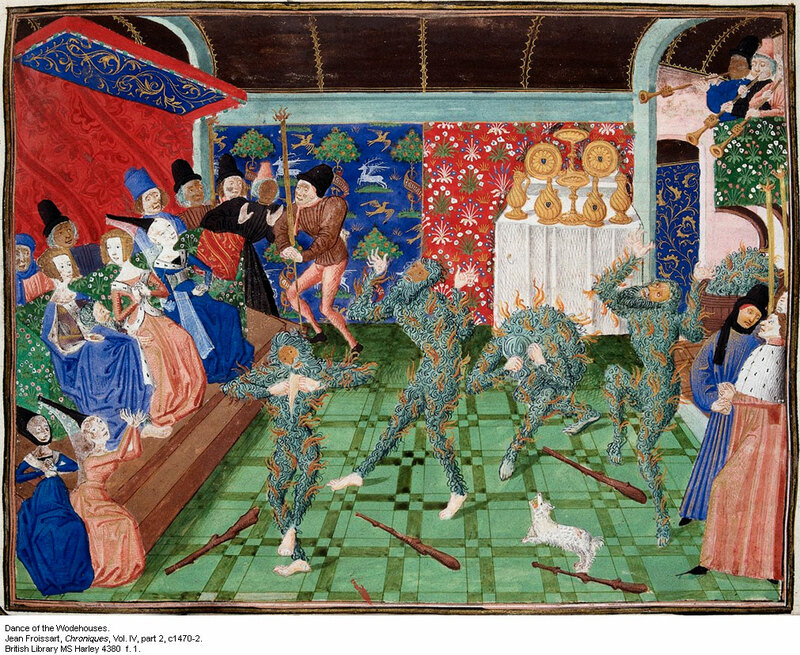 These early dances developed into the Saint George Plays, in which invariably the central incident is the death and restoration of one of the characters, a survival again, of the pagan celebration of the death and restoration of the year. Encyclopedia Britannica says “Sword dance, folk dance by men, with swords or swordlike objects, displaying themes such as human and animal sacrifice for fertility, battle mime, and defense against evil spirits. There are several types. In linked-sword, or hilt-and-point, dances, each performer holds the hilt of his own sword and the point of that of the dancer behind him, the group forming intricate, usually circular, patterns. Combat dances for one or more performers emphasize battle mime and originally served as military training. Crossed-sword dances are performed over two swords or a sword and scabbard crossed on the ground. Finally, guerrilla dances in circular formation are often performed with swords. A simply variation of the above motif is The Mummers’ Play. It includes a lots of dancing, as well as the image of a character killed and restored. The major difference between The Mummers’ Play and The Sword Dance is the introduction of subsidiary characters in the latter part of The Mummers’ Play. This involved the taking of a collection and the appearance of a Turkish champion, or Blustering Giant, or a Dragon that slays the Christian hero, but who is eventually poisoned by a pill presented him by the doctor who has been engaged to attend the injured Christian hero. “Notwithstanding his important role in ballads and prose fiction, Robin Hood would have been best known in communities throughout fifteenth- and sixteenth-century Britain as the subject of a wide range of theatrical and quasi-theatrical entertainments. Most took the form of ceremonial games, dances, pageants, processions, and other mimetic events of popular culture of which we only get a fleeting glimpse in surviving civic and ecclesiastical records. 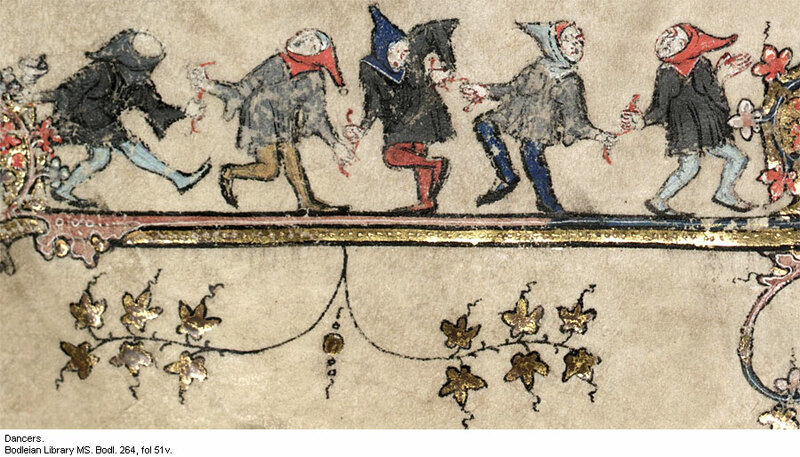 Revels featuring the legendary outlaw appear to have surged in growth towards the close of the fifteenth century and remained popular from the royal court to the rural village green throughout the following century (Lancashire, p. xxvi). Indeed, it is not exaggerating to say that Robin Hood plays and games were the most popular form of secular dramatic entertainment in provincial England for most of the sixteenth century (for records of performance, see Lancashire, index under “Robin Hood”). This is generally unrecognized by both literary and theatrical historians, many of whom assume that the Tudor Reformation quickly put an end to such popular pastimes — it did not (White, p. 163). But there are other reasons for overlooking Robin Hood spectacles: few Robin Hood play scripts survive (folk plays were rarely written down and published) and only in the past few years have archivists and provincial historians (many working on the Records of Early English Drama project) begun to document in a systematic way records of theatrical entertainment in early modern England. During May Day celebrations, The Robin Hood Plays were performed. Robin Hood is the fictional character we recall as “robbing the rich and giving to the poor.” In France, however, he was a shepherd and Maid Marian was his mistress. Some experts believe Robin Hood is a more modern version of the God Wooden. In the play cycles, he is the “king” of May, who fights with Friar Tuck and other assorted characters. Dancers often accompany the “battle scenes.” The plays were performed upon the village green. These plays represent an increasing preference for a national hero during 16th Century England, a spirit of nationalism that grew during the Elizabethan period. Parks, Edd Winfield, and Richmond Croom Beatty. The English Drama. W. W. Norton, 1963, pp. 5-6. Preston, Michael J. The Robin Hood Folk Plays of South Central England. Comparative Drama. Vol. 10, No. 2 (Summer 1976), pp. 91-100. This entry was posted in British history, drama, Great Britain, medieval, religion, theatre and tagged British history, drama, folk plays, medieval, pre-Elizabethan, The Hock-Tuesday Play, The Mummers' Play, The Robin Hood Play, The Sword Dance, theatre. Bookmark the permalink. You might also be interested in the Old Tup Plays (owd Tup in dialect) of Derbyshire and South Yorkshire which basically tell the story of the song: The Derby Ram. http://www.folkplay.info/Texts.htm These were little more than an excuse for young men to go from house to house in disguise demanding money and.or beer, and also an excuse (in the early 20th century before the plays finally died out) for them to get access to pubs underage. One old chap in our village (long since gone) said he remembered an old tup head (sheep’s skull) disposed of on the middin at the back of the village cobbler’s shop. So the tup traditioin existed in our village in Victorian/Edwardian times. Here’s the song: http://www.folkplay.info/Texts/86sk–lj.htm. Think of it as wassailing with menaces. Oh, Jacey, how kind of you to share this information! My undergraduate degree was a comprehensive one (meaning no minor subject). It was English, speech, journalism, and theatre. I have used all extensively over the years and was most thankful for the degree when I was still teaching. The administrators always turn over courses dealing with journalism and speech to the English teachers. We also were the ones to take on the play productions. I looked at the information briefly, but I play to return to it in more detail once I can get my head off the pillow for more than a few minutes. I have had bronchitis for more than a week now. I am having difficulty shaking this bout with an infection. Ouch. Get well soon. I’ve had bronchitis. It’s not fun.